This recipe for Egg Dishes was submitted by ks3398 on 3/6/2005. Click here to view the recipe. If you are in one of those moods where you don't know what you want... this is it! In fact I'm going to make one now. My mom would crack a few eggs, add a little evaporated milk, salt and pepper and scrabble in a bowl. Then, make a hole in center of bread slices, melt a little bit of butter in a pan. dip each slice into mixture, place in pan and add another egg in center. We loved it this way growing up . Yes it has more egg in it, but mama always cooked it in a way mama's do. Cooking for 8 wasn't easy. My family always called this a "hole-in-one". I make this for my wife, by request, on her days off. I find that medium size eggs work best. She calls them Toad In A Hole. I have also heard them called One Eyed Jacks. In PA, we call this a Bulls-eye. Tasty! Very tasty and very fast! Egg in a frame is what we called them. I like to put an egg in the hole and then I top it with another egg and sometimes some cheese. I had these as egg-in-the-hole, but a little different in that a hole wasn't made in the bread, but a cup was used to squish the bread down really flat in the middle (the egg still cooks well as the bread is so thin, and the yolk is easy to avoid over-cooking this way. Both sides of the bread are buttered, giving that golden and crunchy feel of a grilled cheese sandwich. I eat this nearly every day, with a few drops of Tabasco sauce. Hate it when the yolk hardens. I had this for dinner last night. I used sour dough bread. It was awesome! My grandfather used to make this and I love/loved it! Also grew up eating this and still love it today. This has been one of my go-to quick breakfasts since I learned to make it in home-ec for boys in 7th grade. It was called "Eggs in a Box" Interesting to find such a lifetime favorite here. My favorite breakfast growing up. My mom buttered the bread before cooking. We called them bird nest eggs. My kids sometimes request this for days straight, but just change the sides and it's good! Great breakfast and sometimes, even a better dinner! This is a very good breakfast. I have it almost every weekend. I used to make this for my son and daughter when they were little. My son would always request it when he was older. Comfort food at its best! This is delicious recipe! Mmmm! Thanks for the idea. I had this for the first time while visiting my son and his wife in New Lenox, IL I ordered mozzarella cheese with it. Oh my gosh! It was so good. Wonderful and yummy. Reminded me a of being a kid when my grandmother would make it. I grew up eating these. My dad used to call them Roy Rogers Eggs. I guess he made them on the show once. They are still nostalgic for me. For extra yumminess, butter the bread before frying them. This is good with just regular white sandwich bread. One of my favorite breakfasts growing up and as an adult. Mine never turn out as pretty as your picture. But, they always tastes great. Plus, it's crazy easy to make. Yeah! Love this and it's so easy too. Delicious recipe! When done, I flip it back to the egg side up and place a piece of American cheese on the top. It's so good and fast. My father used to make this for me when I was a kid and called them "a**holes on toast". We'd laugh. I had a weird childhood. My mom called this "Egyptian-eyed" sandwiches. I think it was from an Abbot & Costello movie, where they made them; and called them that. I still make them 50 years later! Our family term was always "Egg in a Basket". My kids request this every Saturday now. It's easy to make so they usually get what they want. I have my oldest crack her own egg into the hole and she loves being part of the cooking process. I agree with Carletta - this is commonly referred to as a 'Bird Nest'. I love this recipe over veggies in the morning. The egg bursts over the savory veggies and makes the perfect sauce. 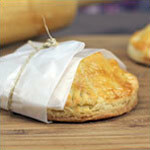 You can also bake these, but watch out because the eggs can get rubbery if in the oven for too long. My mom made this for me and now I make it for my kids. It's a family classic and we LOVE it! My mom called this "birds nest". Instead of bread she made french toast with the hole/egg in the middle of the french toast. I remember it fondly. This was my favorite as a kid. My mom used a heart-shaped cookie-cutter. I know this as Gashouse Eggs. Delicious. After I flipped it I also added some cheese and added the lid and it was amazing. I am 15 and I love cooking. Who could imagine something so easy could be so delicious? I love Egg in a Hole. 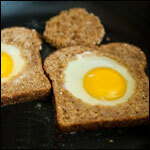 Dip the cut out bread into the yolk... Dee-licious! It's best to use a cup or cookie cutter. I also use a put a piece of cheese over the egg once you flip it. Reminds me of being a little kid. Don't throw away the circle you cut out... spread a little jam on it and serve it on the side. I'm a ten year old boy making it for the 1st time! If you like a harder egg cook it for 4 or 5 minutes instead. It is easier to just bite a hole in it. My dad called them "Sock in the eye eggs". He'd use a small, narrow lipped cup or glass to make the center. I find this works better than a sharp knife especially if the bread is moist and/or thin. Made these when I was a kid. Good way to teach your kids how to cook something easy. Try adding a cheese sauce over them when done... mmmmmm. I always season eggs while they cook, it makes a big difference compared to salt and peppering after they have finished cooking. Tasted good, maybe just a little bland for my liking. It tastes really yummy with sliced banana and grated cheddar!! It's a strange combo but trust me! My mom made this for me all the time growing up. I just made it for my 5 year old niece yesterday and she loved it. It goes really great with a slice of cheese melted on top of it. SUPER easy and yummy, tastes just like a fried egg sandwich that I usually make, this is a lot more fun and EASIER to make AND to eat I'm going to start making this more often and add different ingredients like cheese to it. My daughter loved it, she doesn't like egg whites but was able to eat them this time. We call it birds in the nest, and I use cookie cutters to make different shapes. Definitely delicious with ketchup... super easy! Loved it! This is my kid's #1 favorite breakfast. We have a heart-shaped pancake ring we use to make the hole. Fun. My dad used to call it popeye. This is Old School and Old School Rules! Very good. Absolutely! And Mayonnaise also with the Cheddar Cheese... It's also wise to start the bread to toasting first before adding the egg... That way the bread won't be soggy with snot-type of egg white stuff. OKAY? My family calls these "one-eyed pirates", they were in a kids' cook book. Also, we have shredded cheese on top. Wow. Excellent recipe! Taste especially good when you use Pepperidge Farm Whole Grain White Deli Flats bread. It adds a touch of sweetness to the recipe. I also top it off with a slice of fried salami to satisfy my meat craving. My dad used to make these for me and called them boy scout eggs. I love mine with a little pepper. Love these - quick and good! Growing up, we buttered the bread on each side directly, rather than buttering the pan. To get a perfect circle in the bread, press the open end of a drinking glass into the bread. These actually don't look or sound that bad. Are they easy and quick though? My mom made this for me and now I make it for my daughter. We call it "Birdies In A Nest" in Wisconsin. Terrific. Grew up eating these and my Grandmother called them Moonie Eggs. My dad calls these "Roy Rogers eggs"... reminds me of Sunday mornings as a kid. Original name is egg in a nest! My grandmother cooked these for me for years. They are much better topped with a slice of your favorite cheese. 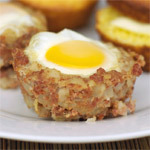 This recipe is a real Aussie breakfast idea! It is great for when your on the run but even better when you sit down with your family and enjoy that good old taste of the 60''s! Ahh.. Loved this as a kid and still love it. They are so delicious when sprinkled with Lawrys seasoned salt. It's amazing. Haha good recipe thanks. Very good and fast breakfast. Mmm Mmm Good! I love these, my mom would make them all the time when I was a kid. This kicks a**! I could eat an intire loaf of these. I just made this for my hubby I used a cookie cutter he was very surprised. We adult don't make breakfast fun to often. Will do again and again! My mom used to call this Hawaiian Eye Eggs when I was in grade school. 49 years and still lovin' it. I use a juice glass to make the hole. And I too fry up the circle of bread for dipping. I use to make these for my kids all the time back in the 1970's - 1990's. They loved them. Sometimes we would cut the whole in the center of the bread with cookie cutters to make it more exciting for them. Sometimes we would put syrup on them like a waffle or pancake. Try it you'll love it. When I make eggs in the hole I like to put a little honey or brown sugar in the butter, then sprinkle the flip side with salt so I get a savory/sweet taste tango with the sweet side developing a nice, almost candy, crisp! yum! Hi from Australia and I use egg cups to cut from bread for extra dipping and make a circle in toast with large glass... very similar and sure is yummy. We use Parkay Buttery Spray and leave the egg runny; sop up the extra yolk with the leftover bread...yummy! My kids love this. I've made this for them for years. We love it. Man I made it this morning it was a great meal lol and the guy who said medium is too much... he's right keep it lower then that. Of course you have to crack eggs one at a time, der. Medium heat is too hot, and 3 minutes for the first side is way too long. My wife made this for me - its great. I remember my grandmother making me this when I was a little girl.. Now I make it for my Hubby and he loves it! One day I hope I can make it for my kids as well. 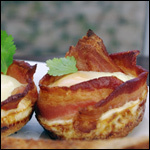 This recipe is also good if cheese is added on top of the egg. To prevent wasting, the cut out circle can be placed back on top over the egg. The first thing that kids like to do is take the top off and nibble on the cheesy circular piece. This is like how my mom used to make it. It is great! I like to use a large 3 liter bottle cap and make 3 holes in the center, I fry the leftover bread pieces. They are great dipped in the yoke. Kids love it. SUPER EASY TO MAKE!!! Easier than just cooking eggs alone, and it is more fun. The main dish in V for Vendetta tastes great! Yummy! Just tried this for the first time,I put grated cheese on the bread after the egg had set and grilled the bread until cheese had melted and then topped it off with tomato ketchup... the best thing since sliced bread! This is a great way to start your morning and have fun with the kids while on a camping trip. Especialy when making this over a camp fire. This is great for kids. My mom made this for me back in the early 60's. I loved to help her make them. She would give me a very small mouthed cup to make the hole & I got to butter the circles. It was fun! Great memories of us now she is gone. This is only the 2nd time I have seen this in print. 1st time was earlier this year. Thanks! I prefer using a small glass such as a shot glass, or something similar to simply cut the hole in my bread. Simply lay your bread on a hard surface, position the glass in the center of the bread, and push down. I also have received positive comments by sprinkling cinnamon sugar over the egg in a hole when it is finished cooking. I dip and roll the spare bread from the hole in the cinnamon too. Yummmmm!